Initially, this reader thought this was a young adult book, but as she began to read, she recognized a younger voice. 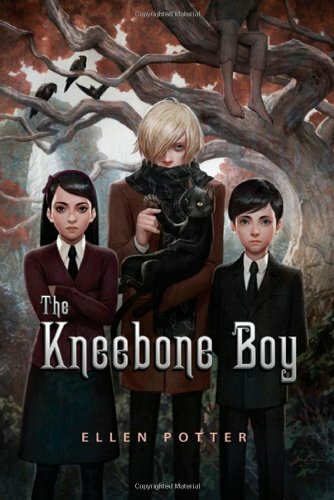 The Kneebone Boy is a middle-grade novel telling the tale of three peculiar children—all siblings—a sister and her two brothers. Their mother has gone missing and the town suspects the older brother, thirteen-year-old Otto, of murdering her, possibly with that ubiquitous scarf he wears around his neck. He never takes it off. The three siblings, the Hardscrabble children, are sent away by their father yet again while he travels for work painting portraits of odd and mysterious princes, sultans, and other esoteric specimens of royalty. When Dad sends the children to the home of a relative that unbeknownst to him, is on vacation, that’s when the story really takes off. The “Hardscrabble three” take advantage of their freedom to run roughshod over London and indulge in any opportunity for adventure. Their major goal: find the kneebone boy who is possibly half human, half animal, and certainly deformed—according to local legend anyway. This story is told in a unique and quirky way. One is not even completely sure of the narrator. It is one of the children, but you have to parse your way through the narrative to figure out who it is. Sometimes the author moves from first person to second person in point of view, talking directly to the reader. This may sound confusing, but it’s not. It works. Splendidly. This story may be weaved with elements of magical realism, horror, or fantasy. Which one—or any one? You have to read The Kneebone Boy to find out. That’s part of this book’s charm. One is not completely sure. You race through the story, anxious to know how it’s all going to end. And the ending is quite a twist. You will not see it coming. The Kneebone Boy may technically be a middle-grade novel, but more mature readers, including adults, will enjoy it. It’s a story of adventure, mystery, and poignancy. After this literary tour de force, what will Ellen Potter come up with next?